In my year of healthy changes, I've become very interested in the healing properties of essential oils. I've read and researched and interviewed and experimented... it's all just very, very fascinating to me! 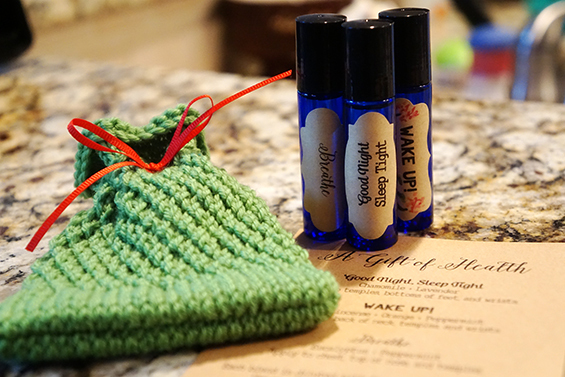 While my collection of oils is small, I've picked up several to help with my family's sinus and skin issues, muscle aches, sleeplessness, and just overall wellbeing. And maybe it is, but I've been pleased with the impact they have had on our household. 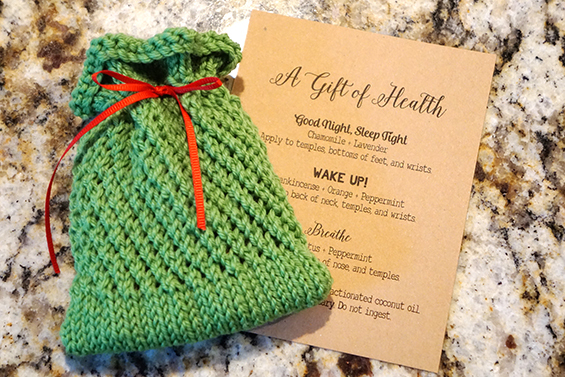 So, for my handmade Christmas efforts this year, I thought it would be nice to share a gift of health with my kids' teachers and a few friends. Not to one to knock a great drinking vessel, but do they really need another mug? My other idea was a gift card to Dunkin' Donuts. Mmmm... doughnuts are my kryptonite. They may really wish I'd given them a gift card!! 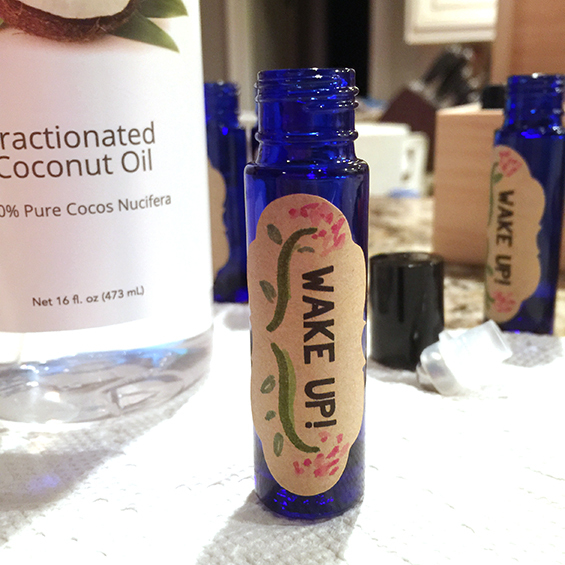 I made blends that I thought would be universally appealing - for sleep, alertness, and sinus relief. I used some recipes that I found on Hello Glow as my base and customized from there. 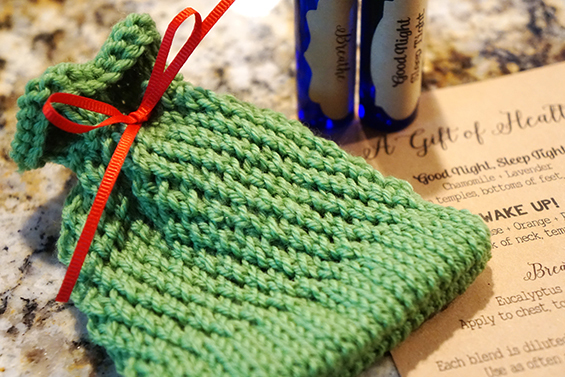 I then knit up these adorable little bags to carry them. For the knitters among us, this is the first pattern that worked up on my own! I shouldn't be this proud because it's so simple, but I am. I added a Christmas ribbon and a menu card... Voila! 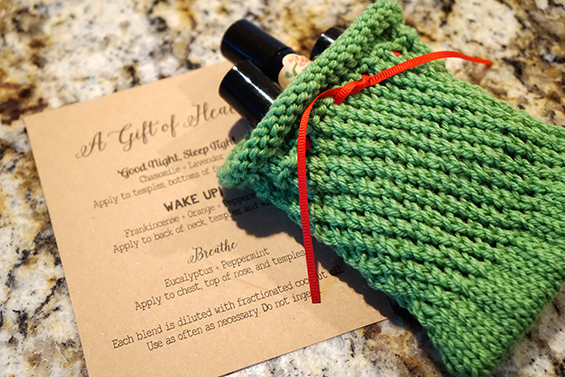 A simple, yet very personal little gift. If you think this is an idea for you, you are completely welcome to my files, recipes, knitting pattern, etc. Just let me know what you'd like. I am curious - if you are a teacher, would you use a gift like this or would it be regifted? I would love to know if I'm just thinking inside of my own bubble. 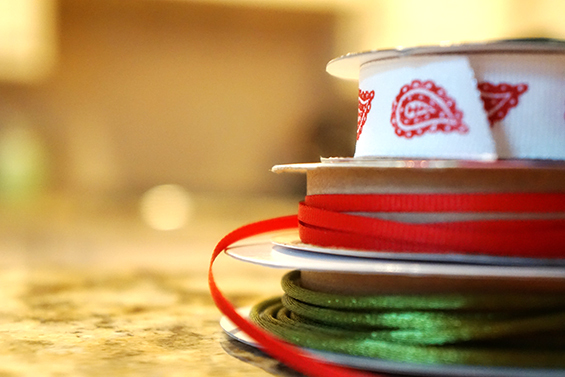 What are you crafting for Christmas this year? I'd love to hear all about it!